Lindsay Webb was a colourful personality and champion player of the East Devonport club in the golden era of northwest football in the 1950s. Webb commenced his senior career with East Devonport in 1946 and played for Tasmania in the 1947 Australian Carnival in Hobart. He became captain-coach of East Devonport and was runner-up for the 1949 and 1954 Wander Medal for best player in the NWFU. Webb caused a sensation in 1956 when he crossed to East Devonport’s arch-rival, Devonport, where he played 16 games in his only season there. 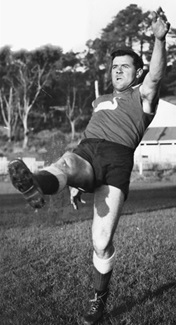 Webb also played and coached in northwest country football in the early 1960s and was the first senior coach of a young Darrel Baldock in 1955.